It’s #ThirstyThursday. 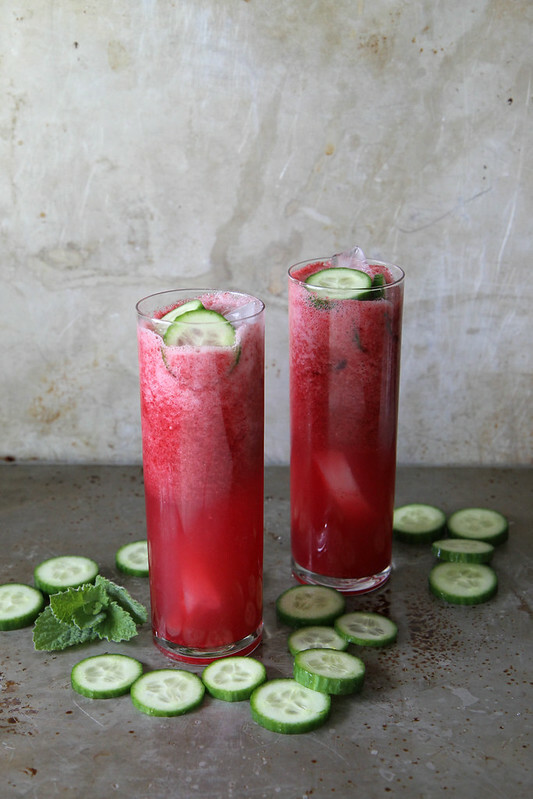 Are you ready for these Blackberry Mint Cucumber Tequila Coolers? Can you handle them? I can. Like 5 of them. These are rip offs of the drinks we had an awesome Mexican place in New York a few months ago. (I also recreated this drink I had there). I have no idea what the name of the restaurant is, and since several of you have asked, I will go find it in the next couple days as we are staying very close. In fact. Maybe I will go find it by sitting out in the sunshine on their patio and sucking down a bunch of these coolers or these crushes while I simultaneously gorge on chips and salsa. I don’t know, it’s just an idea. In the mean time, let me tell you about the magnificence of this combo. Tequila. Lemon. 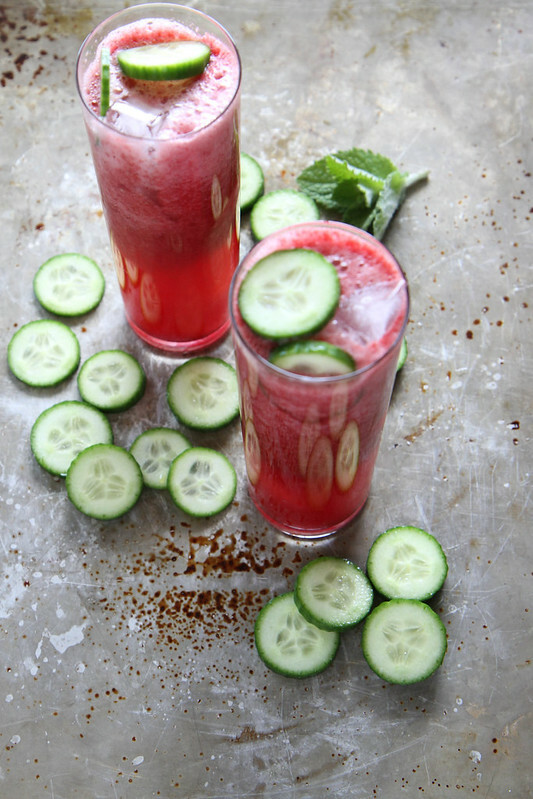 Cool and refreshing mint and cucumber juice and then super sweet and brilliantly colored blackberry syrup. It’s beautiful, not to sweet and totally delicious. I hope these make it to your happy hour this weekend! For the Blackberry Syrup: Bring the sugar, water and blackberries to a simmer and let cook for about 5 minutes over medium heat, breaking up the blackberries as they cook. Strain the syrup through a chinoise and reserve juice. Discard the blackberry pulp. Chill the syrup. In the jar of a blender, combine the cucumber chunks, the mint leaves and lemon juice. Puree until you have a smooth mixture. Strain through a chinoise (fine strainer) into a jar. Fill two large glasses with ice. Add 2 ounces of tequila to each glass and the thinly sliced cucumbers for garnish. 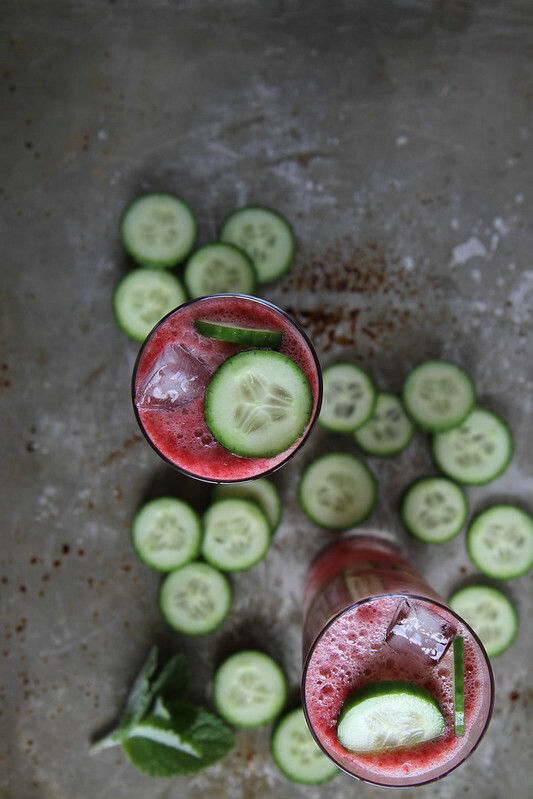 Add 3 tablespoons of the blackberry syrup to each glass and 3 tablespoons of cucumber-mint mixture to each glass. Top with chilled club soda and stir well. Serve with a sprig of fresh mint. *There will be leftover blackberry syrup and cucumber mint juice- but all the better for a second round! Thirsty Thursdays are the best and I could drink one of these drinks for breakfast. Blackberries, cucumbers…that could be an acceptable breakfast right? Thirsty thursday indeed!! This looks awesome! These are just gorgeous. That color is perfection. YUM! I bet this would be amazing even without the tequila, too! But really, why would ya? So gorgeous, love the blackberries and mint combo! You’ve got be pegged. This drink has my name all over it! Cool for a hot Mumbai summer……. will be tried and tested today. I’m sipping my first one and here is my review: yum! Very pretty, but now that I’ve tasted it I’ll admit I’d have a second one if it looked like pig’s bath water. Well, maybe not really, but anyway… It’s not super sweet, thank goodness. The cucumber and the mint balance the blackberries. It has a lot of depth, and though you can discern the individual favors, it’s more like watching the Soul Train Dancers under a strobe light – it’s a great show, even if you can’t pick out your favorite dancer. With Summer drawing to a close, I hope that this drink is as good with frozen blackberries. Here’s to you, Heather. Clink.